I don’t usually mention covers in my reviews but couldn’t resist! The cover is stunning. The butterflies , moon and stars sparkle and alongside the background midnight blue makes you want to pick it up and find out what’s between the pages. It’s Saturday 23rd April Jack has gone off to find himself and Cat is alone when she receives the phone call to tell her she’s won first prize in the competition in which she entered months ago. Adam Lawley proposes to pretentious girlfriend Maddy and is left heart-broken when he realises how lightly she’s taken their relationship. When Cat and Adam meet at Chapman’s Architectural Salvage, Adam is looking for Cotswold tiles and Cat is the Office Manager who takes him into the yard to find them. With our main characters in place, we begin a humorous and sometimes stressful romantic journey. I was fascinated by Adam’s job as a freelance project manager in restorations. This is integral to the story and very believable. I loved the banter between Cat and her best friends Bex and Tess. Being in Tuscany was great! What I really liked about the plot is the fact that it isn’t drawn out. Half-way through I thought, where is this taking us? We’ve nowhere left to go … so I loved the how the plot changed after this. I really liked Cat until something happens half-way through a trip which I thought was unfeeling and callous. I understood why she abandoned the journey and made her way back home but she done it with so little care that I found it hard to identify with her after that. The romance is very uplifting. I have to say that sometimes, more can be conveyed from shutting the door on those bedroom scenes. The lead up showed very clearly the passion and emotions and this is just right in this story. My favourite character has to be Fanny the wedding planner. Hugely entertaining, she adds conflict and tension! 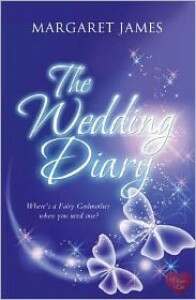 I wondered what I would think about The Wedding Diary after having read Margaret James’ The Silver Locket. Two totally different styles of writing and genres. Margaret James has shown her versatility in this entertaining chick lit that is uplifting.